Virginia native Kit Watkins is a legendary keyboardist, instrumentalist and composer of music in multiple genres. Starting with progressive rock band Happy The Man, Kit honed his skills in composing, performing, arranging, and producing. During its six years, the band recorded five albums, including two released on Arista Records. In 1979, Kit then joined the British band Camel for an album and several tours of the UK, Europe, and Japan from 1980 through 1982. Kit's solo career began in 1980 with the self-produced album Labyrinth, released on his own Azimuth Records label. He also recorded and performed with drummer/percussionist Coco Roussel during this period. During the 80s, Kit continued to produce solo and collaborative albums. 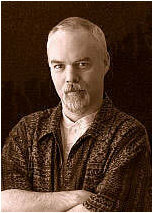 In the early 90s, Kit formed a new label, Linden Music, which released a number of his new recordings, as well as CDs by Robert Rich, Jeff Greinke, David Borden, and others. His music style has changed focus from album to album, and has encompassed such varied forms as progressive rock, electronica, ambient, jazz, and world-fusion. Some notable influences include artists such as Brian Eno, Mickey Hart, Mark Isham, Joe Zawinul, Harold Budd, Wayne Shorter, Steve Reich, Joni Mitchell, Jon Hassell, Eberhard Weber, Jeff Greinke, Steve Roach, and Wendy Carlos. In 2001, Kit performed a milestone concert in Philadelphia for The Gatherings series, hosted by Chuck van Zyl of Star's End Ambient Radio. It was Kit's first performance in 20 years, and his first ever as a solo artist in a new genre. In preparation for this concert, Kit began learning and using an electronic wind instrument as the focal point of his stage performance. Also in 2001, Kit briefly formed an improvisational ensemble named Tone Ghost Ether. The group was realized through a natural interaction between three musicians (Kit Watkins, Brad Allen, John Tlusty) searching for a common form of expression. All of the music by Tone Ghost Ether was improvised and played in real-time without overdubs. Kit Watkins is continuing to record and release new works from his private studio in Brattleboro, Vermont. The music of Kit Watkins can be heard on-line at kitwatkins.com, as well as on such broadcast radio shows as Hearts of Space, Star's End, and Echoes, and of course, here on Earth Mantra Netlabel. Kit's wide ranging interests in music and sound allow him to change his focus from album to album resulting in a fresh experience for both artist and listener. As one of the people who can legitimately claim to have influenced the ambient genre at large, we are proud indeed to bring you the music of Kit Watkins.